Nothing warms you better on a cold winter day than a bowl of this hot, great tasting soup! Try it with toasted garlic bread or delicious hot cornbread! 1. 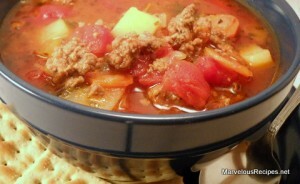 In a nonstick skillet over medium heat, cook ground beef and onion until meat is no longer pink; drain. Transfer to a 5 quart slow cooker. Stir in the salt and pepper. 2. Add all the remaining ingredients and stir to blend well. 3. Cover and cook on Low for 9 to 11 hours or until vegetables are tender. Discard bay leaf before serving. Makes 7 servings.